What are we going to accomplish with this house? 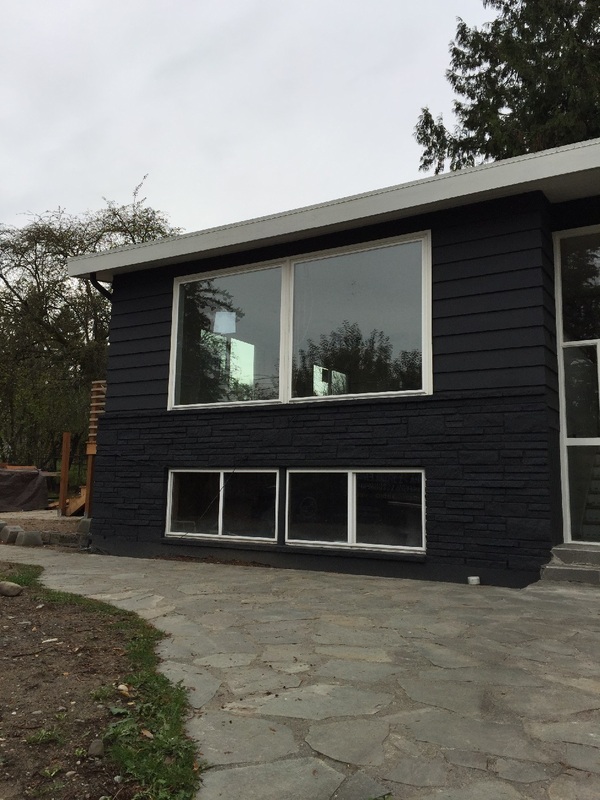 In today’s blog I wanted to give you the full details on this house; what we have to work with and what we have planned to accomplish for our clients. 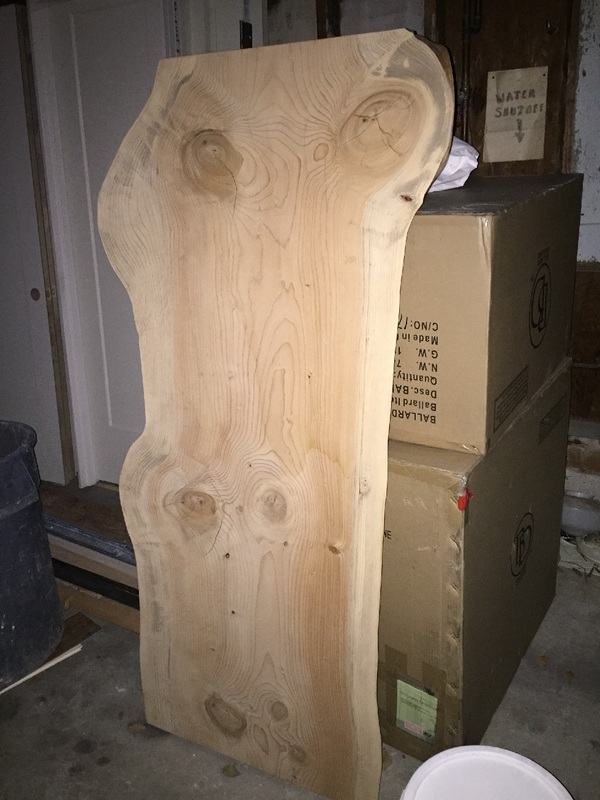 What Are the details of the house we are remodeling? What is our goal for this project? To enlarge the house, without going outside the footprint by opening up walls (to make small spaces feel bigger)and create updated living spaces (bring the homes interior design up to date). We also are going to update the electrical, plumbing and heating to current standards and make it clean (The house is filthy and we currently have a pest problem, more on that later). We also want to lead our client with their choices but keep them on a tight/strict budget. We are teaching them where to spend their money and where to save. 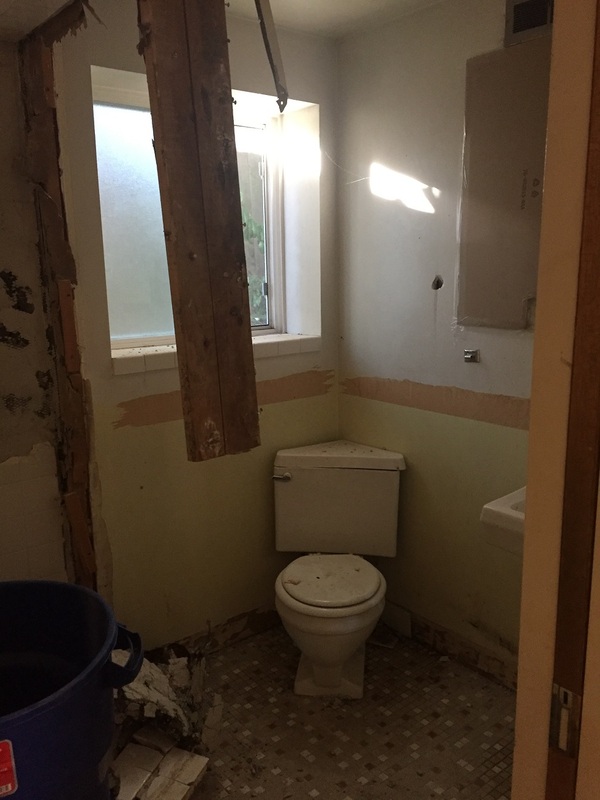 That is always the hard part of remodeling. How do you save money and not make the remodel look cheap? Where do you spend and where do you cut back? We get bids from our sub-contractors for lots of extras (we add the wish list items) and then fine tune the bids (a nice way of saying cut them in ½) to make the scope of the project fit with the budget. This is what Renee does best. 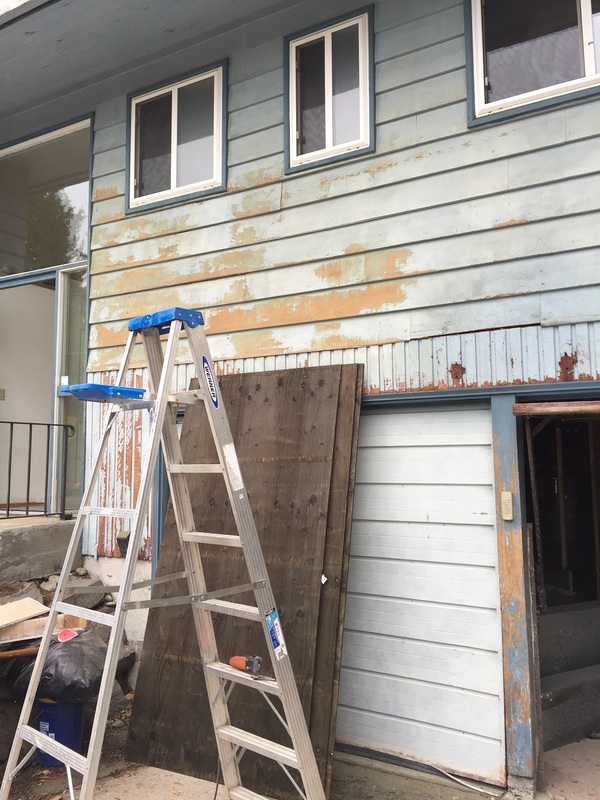 What is the scope of work we are doing to this home? Opening up as many walls as we can to make it feel roomier, add new light fixtures, move electrical outlets to new locations, refinish the existing hardwood floors and add hardwood floors to the kitchen. Repaint every wall, ceiling and molding in the house. We would like to add all new doors and new door hardware to all rooms but this is low on the priority list. We currently have a rat or critter infestation in the attic. 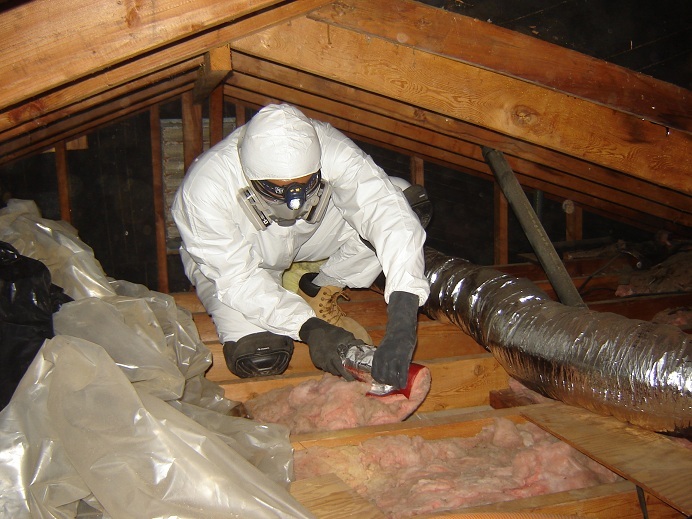 There is a strong odor and many droppings that have been coming from the attic during demoing. 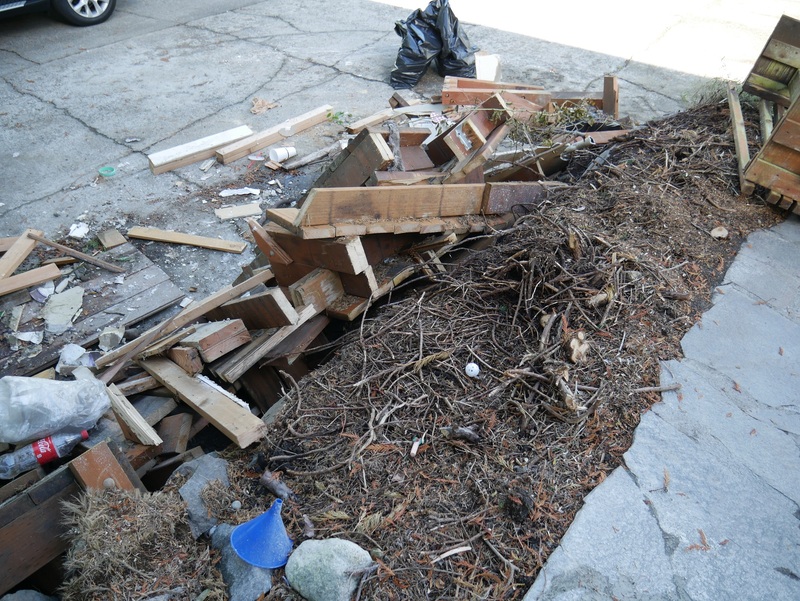 Our sub- contractor has seen droppings soon after he has swept up areas, yikes we need to get this place cleaned up. 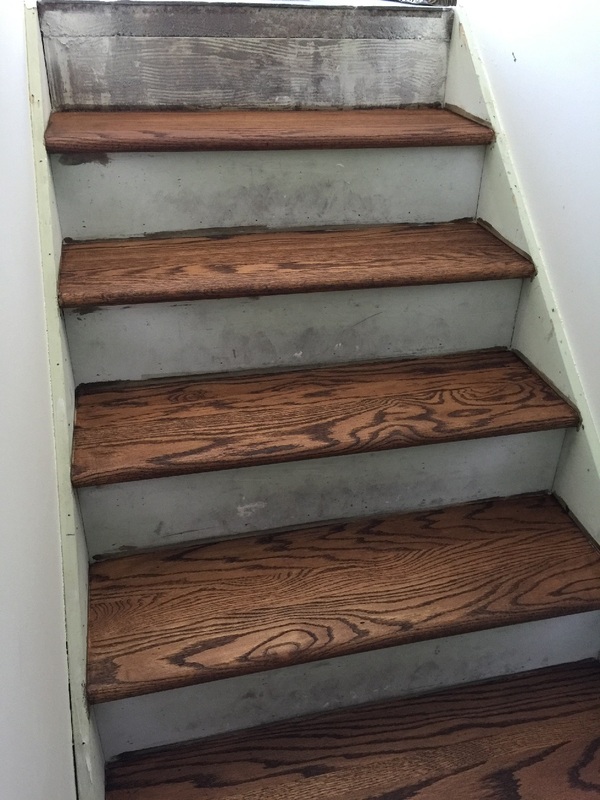 Tomorrow we will be tackling this with a company that will take care of the pests and replace the insulation, and I’m sure I’ll have stories to tell, they may be gross. 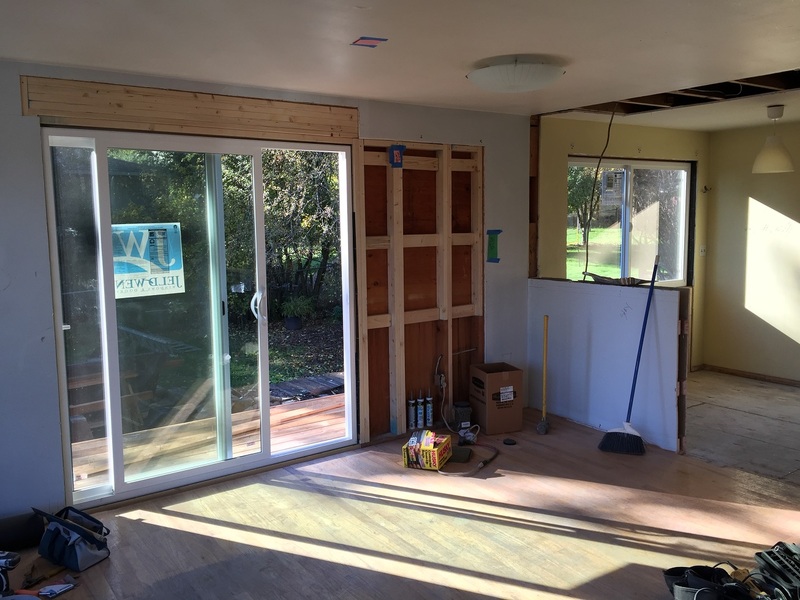 Remove the door and ½ wall in between the kitchen and the dining/living room and install new hardwood floors to match the rest of the main floor. 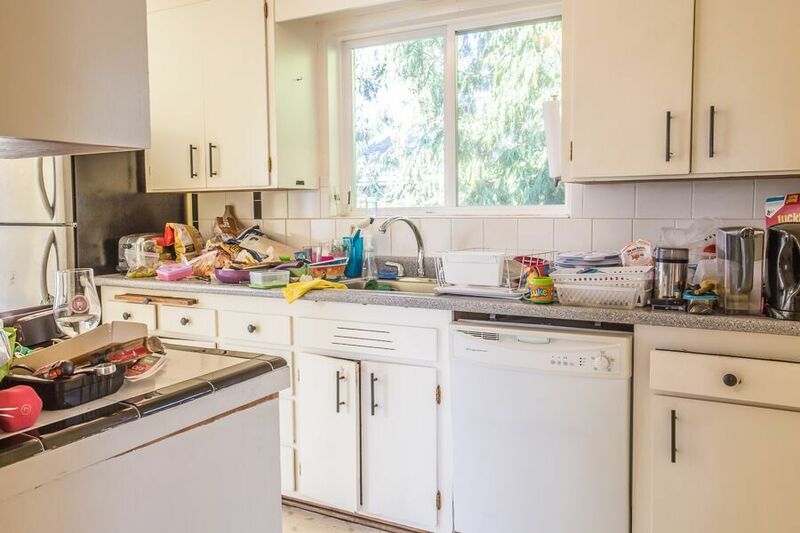 We will install new kitchen cabinets, new countertops and backsplash, new appliances, enlarge pantries and put new doors on them to match cabinets. There will be new light fixtures and we will widen the entry to the kitchen from the main hallway, it is tight and makes the kitchen feel even smaller. 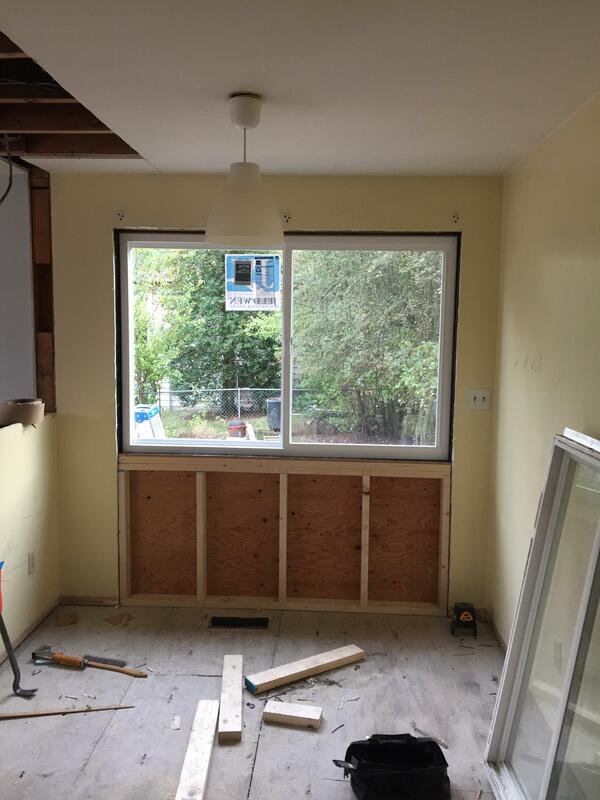 The glass slider from the kitchen will swap places with the current dining room window area, this will create a new eating space in the kitchen now that the door is removed and will add light and outside access to the new BBQ deck from the dining room. 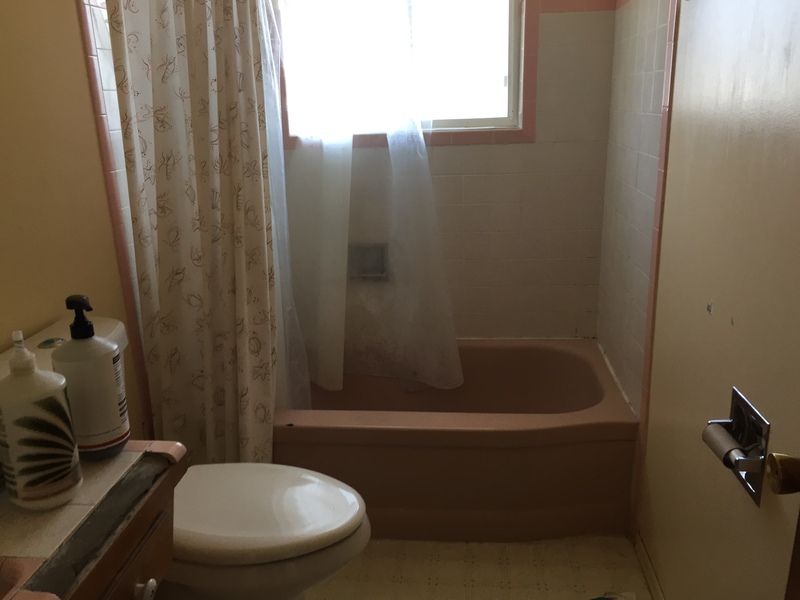 Re-do the main full bath with new cabinet, sink, toilet, fixtures, lighting, tub, tile tub surround (to the ceiling) and new flooring. In the ½ bath replace the countertop, backsplash, sink, faucet, toilet and flooring. 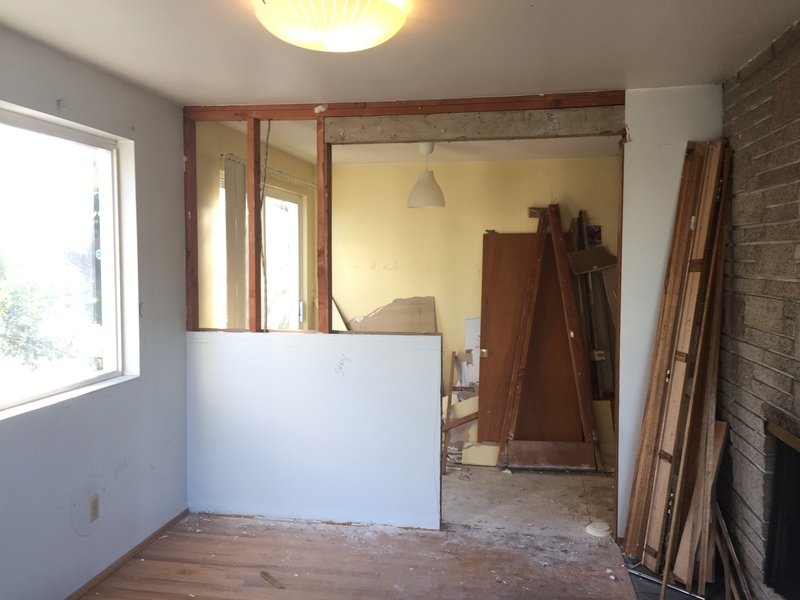 There was a wall taken down between two rooms on the main floor to create one very large room, but this was done poorly by leaving the missing parts of the hardwood floor and it really made no sense. 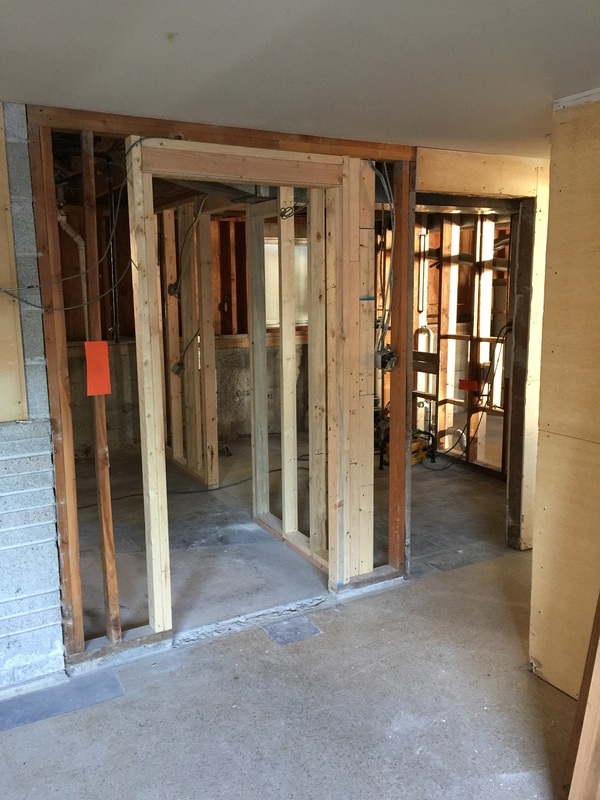 Our clients need the room back as two legal rooms so we are rebuilding the wall, adding a new closet and new outlets to make it back into two bedrooms. 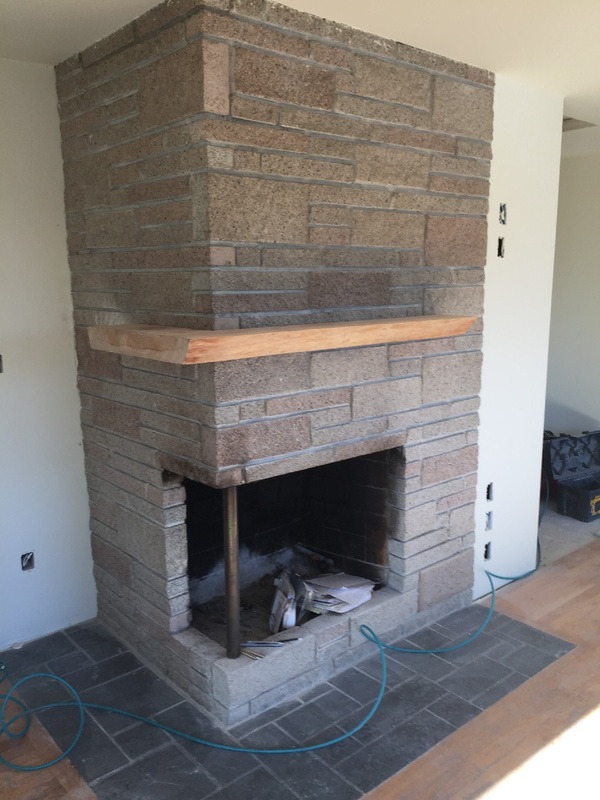 We had great ideas of retiling the whole fireplace (over the existing stone) and replace the current green slate tile at the base of the fireplace but with budget constraints we will be painting the stone façade and leaving the base tile, but clean it up. 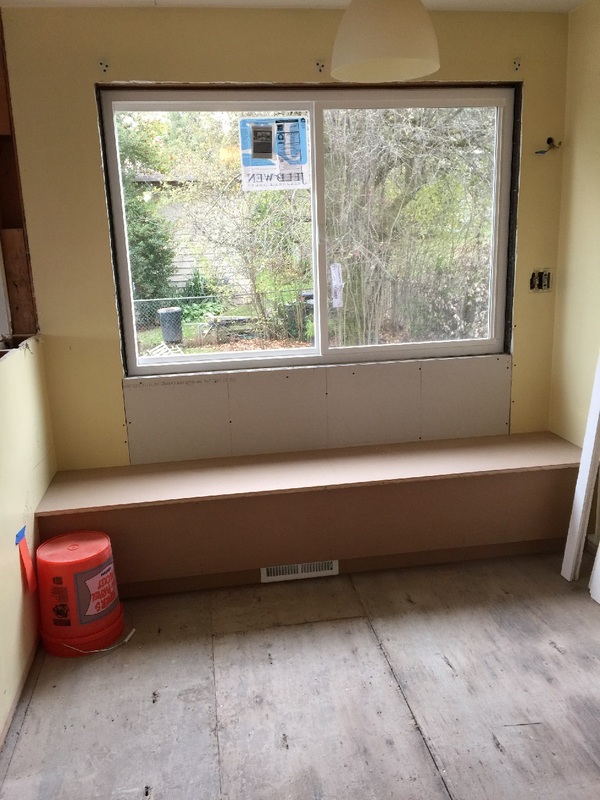 We will add a wood mantle and electrical outlet for a mounted TV. This basement has great ceiling height, good natural light and plenty of square feet; three great ingredients if you have to remodel a basement. Renee has a great eye for spaces and what there potential are, she saw through all the YUCK and saw what it could be. This basement is the scary and smelly part of the house. Regardless of the light coming through the windows, it feels so dark because of the wood paneling everywhere, rose wallpaper in the bedroom and an extremely tight small bathroom. Demoing this basement will make for a clean start. 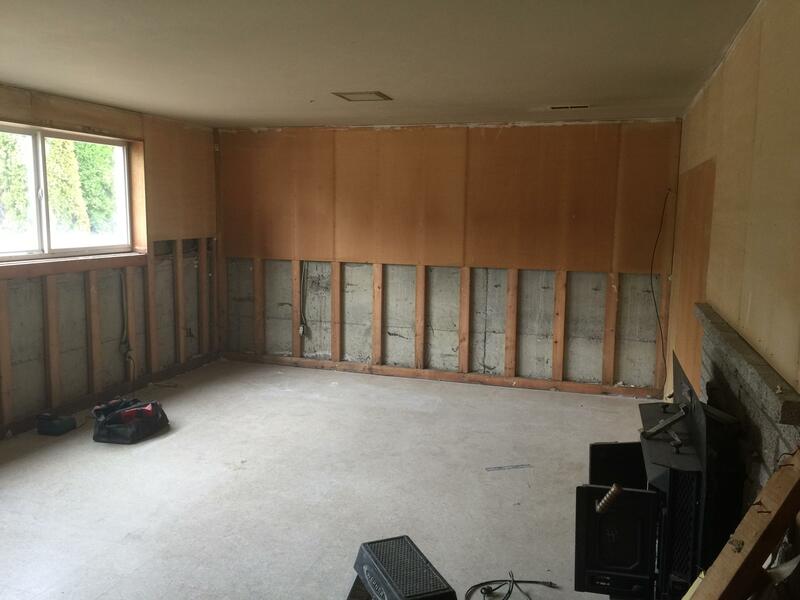 All the wall wood paneling will be taken off, and the whole basement will get new paint. We are creating from the existing basement bedroom a master suite with closet and master bath. It is our full intention to create a new full master bathroom, but with the budget, this room might only get framed and electrical added for now (this is one of those decisions we will need to see how much money we have and it’s a room that will not be seen by anyone other than the family so this could wait to be finished at a later date). We will be adding new carpet to the master suite and all new doors. 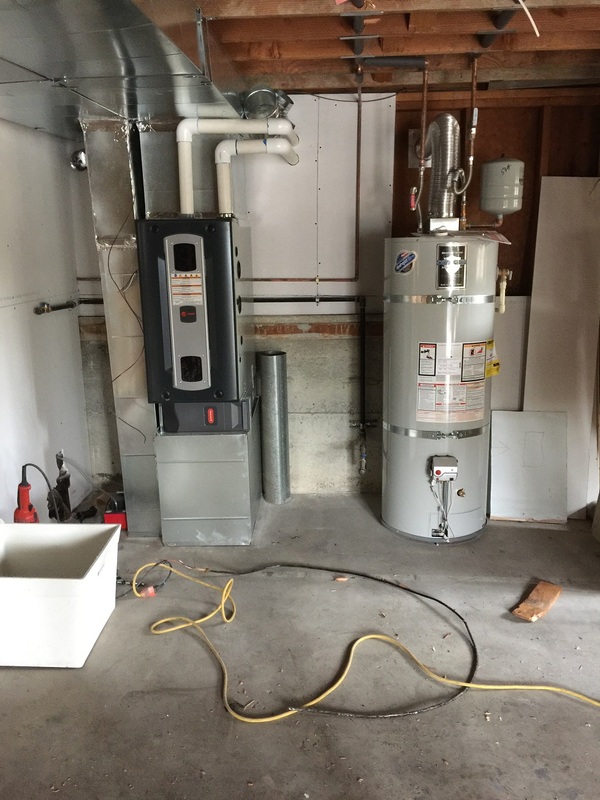 To create the master suite, we will move the laundry, hot water heater and furnace to the back section of the garage. We will frame the new laundry/mechanical room, but we might not be able to completely finish it. We will install new flooring to the hallway and rec-room area, add electrical for a tv and new lighting. Once again, we are using what is there and improving it by rearranging things and moving things out of the way. This lets us use all 1,800 sqft of house space as well as some of the garage. 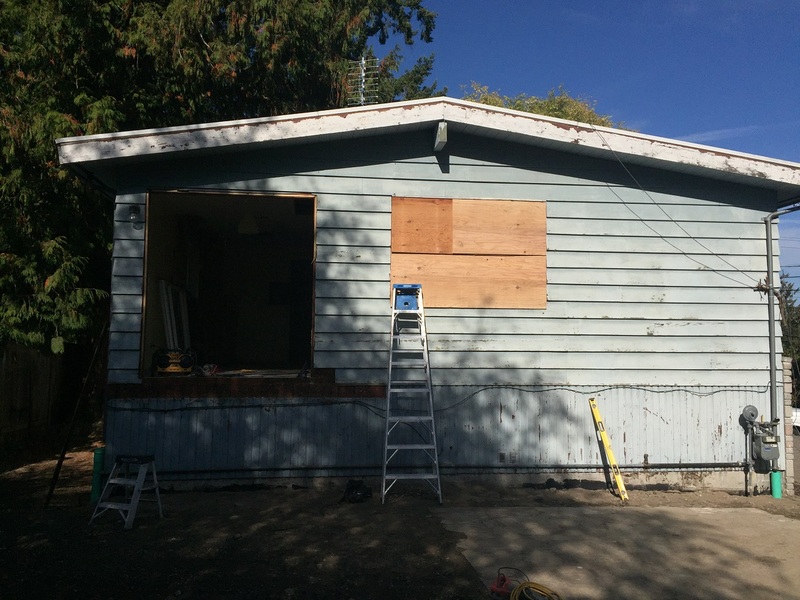 On the outside of the house, we took down the old deck off of the kitchen. 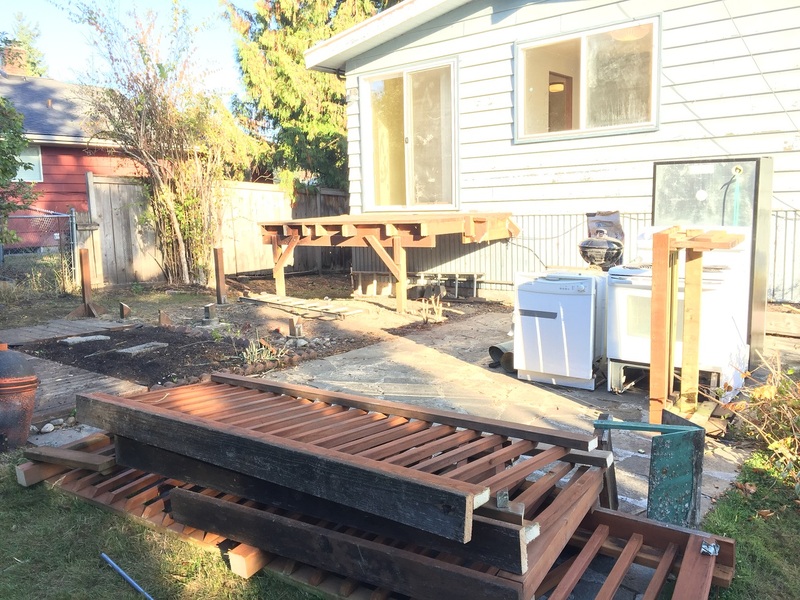 We will be building a new smaller BBQ deck coming off the new dining room. We will paint the outside and add new light fixtures to the area around the deck, over the garage doors and front entry. The home owners want to add a cement sport court to the north side of the house, take out some tree’s and add a new fence. These are things that can/will be done at a later date. There is one tree that is very close to the house which could be one of the “pathways” for the rodents. 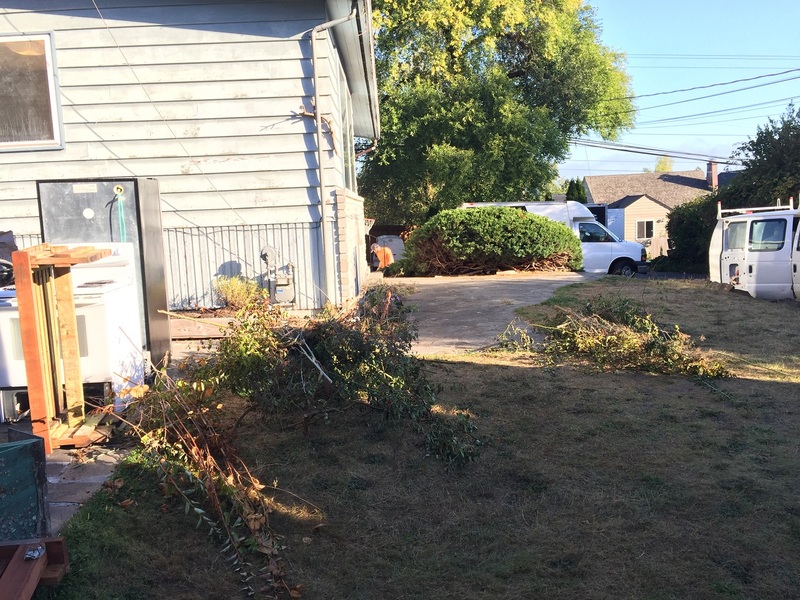 So, this tree removal could advance on the must do list. As you can see we have a lot on our wish list but as we have been gathering all the bids from our sub-contractors, the numbers are high and decisions need to be made on what can be done and at what level of finishes we can buy. Things are moving fast. Another blog post coming very soon, there’s lots to share. Renee Menti Ruhl | Posted in Uncategorized | Tagged Home Remodel, Laurelhurst Real Estate, NE Seattle, Real Estate, Renee Menti Ruhl, Renee Ruhl, Seattle, Seattle House Flipping, Seattle Real Estate, Windermere Real Estate Co. 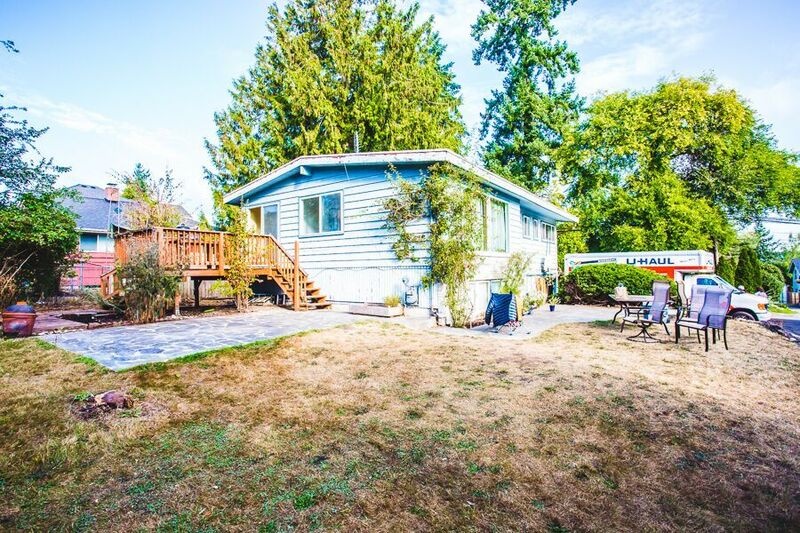 The real estate market in Seattle, if you don’t know, has a very low inventory of available homes for sale. Multiple offers are so common they are expected, and the listed sale price is just the starting point for what feels more like an auction than a typical real estate transaction. These disadvantages have made Buyers in the Seattle area become more interested in fixer-uppers. Unlike the era of house flipping in the early 2000’s, people are buying these homes, renovating them and keeping them. Our clients were no different in their home search. They looked at many houses with Renee, over many months before they finally found the right one for their family of five. With Renee’s trust and guidance they bought this house with the intention of remodeling it and hired her to lead the remodeling project. On September 21, they officially had a new home. There was a lot that needed to be done before this family could move in. We needed to get started. I woke up the first morning feeling excited, I was excited for our clients and excited for Renee getting this house for them and what lies ahead. This was a different kind of closing, we were not saying goodbye for now to our clients, but instead, Renee agreed to work for the family beyond being their real estate agent. I use the term general contractor loosely, but essentially, we are the general contractors on their new house remodel. This wasn’t the first time either of us had built a home, Renee has done numerous new home flips in the past and a new build of her current home and I had designed and built my current home. The only difference was that this was not a house build for either of us, but for this family, for their tastes and their needs. My first thought, don’t screw this up, my next immediate thought, we got this, this will be fun, let’s get started. This morning was the full steam ahead start we need to get this family into their new house by Christmas. We scheduled over 10 contractors to come by at different times to start bidding out the work that needed to get done. It was going to be a long and very productive day. We came armed with pastries and coffee, best to keep the contractors happy and caffeinated, was my thought. At 8:00am I arrived at our client’s new house. I knew Renee had already been here meeting a sewer contractor early. As I was walking up the driveway, my mouth just dropped, I couldn’t believe what I was seeing, the old owners were still moving out of our client’s new house. This was not happening, the moving truck in the driveway was not really there, all the stuff piled next to the garage and on the front lawn was not there. I was so mad inside, I knew I had to find Renee and talk with her before the new family was stopping by to walk through their new house. 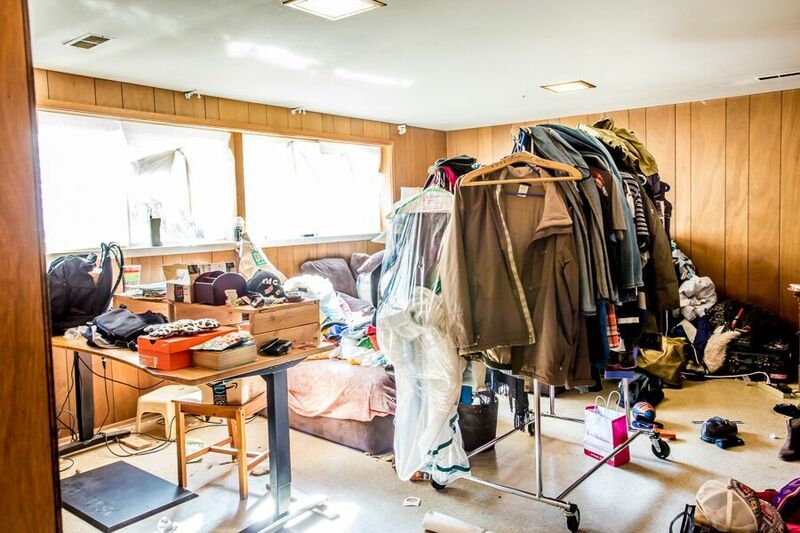 Their house was currently packed with other people’s stuff, completely messy and gross. I found Renee and in true professionalism, she gave me the same look that I was feeling inside but deflected the bad and keep us moving forward with meeting everyone and getting ready for our clients to arrive to this mess. 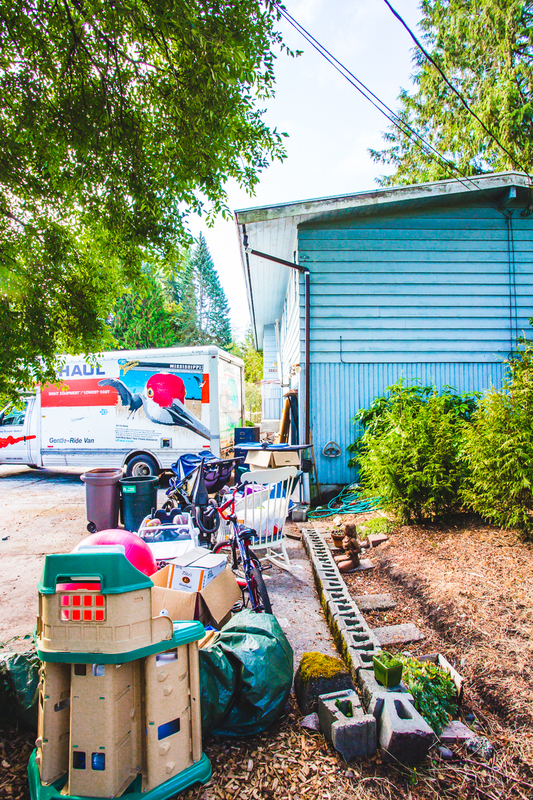 → Did you know that home sellers are given a date to vacate their home when they sell, but ultimately you can take your sweet time moving out and there is nothing the new home owner can do? I guess you can say that we are a society of rule followers because this doesn’t happen that often, or in Renee’s 26 years in real estate it has never happened – until that day. Now you might be wondering about the selling agent, and why didn’t he make sure they were out of the house on the agreed upon close date? Instead of getting into details, let’s just say it’s always difficult for some owners to get out on time. Some are not equipped with the skill set of budgeting for a move and have problems with timing and organization. With patience and a smile, we met our clients and talked them through this mess with the reassurance that these people will be out soon. Soon turned into two extra days of moving and sleeping in the house that was no longer legally theirs. But with the help of the best Windermere Managing Broker, Jordan, and with Renee’s persistence, the house got vacated. That first day was pretty funny, now that I look back on it. It was like a circus, trying to direct and show all these contractors around a house still full of stuff. A few of the family members were not happy about moving and with those feelings came a little screaming, cursing at each other and some pot smoking in the downstairs bedroom – all while we were trying to get bids on electrical, gas, plumbing, demo, flooring, tile, waterproofing, paint and sewer. Of course with all this happening my pastries and coffee were hardly touched. I guess it didn’t make for a very inviting scenario to hang out, chat and drink coffee. At the end of our meeting on this first crazy day with our client, it was reassuring that they believe in us as contractors and were impressed with the future scope of work we gathered we provided them, our schedules and leadership in this project. The family left happy and excited for their new house. It was a crazy day at the house, but it didn’t stop us from getting our bids despite all the chaos that was around us and ending it with a win. Renee Menti Ruhl | Posted in Uncategorized | Tagged Laurelhurst Real Estate, NE Seattle, Real Estate, Renee Menti Ruhl, Renee Ruhl, Seattle, Seattle House Flipping, Seattle Real Estate, Seattle Remodel, Windermere Real Estate Co.
Hello and welcome to the inaugural post of Renee’s Home Remodeling blog. Working as a full-time real estate broker since 1991, Renee was recently approached by a client to be the General Contractor on the major renovation of a home she helped them purchase. After a crazy first day on the job, Renee and her assistant Jessica decided that the stories unfolding before them were too good to be kept a secret and thus… a blog was born. Along the way there will be surprises, laughter and some frustration but in the end, we are confident that there will be a happy ending; a gorgeous home for a wonderful family. We hope you will follow along and enjoy the ride along with us. Renee Menti Ruhl | Posted in Uncategorized | Tagged Home Remodel, Laurelhurst Real Estate, NE Seattle, Real Estate, Renee Menti Ruhl, Renee Ruhl, Seattle, Seattle Design, Seattle House Flipping, Seattle Real Estate, Windermere Real Estate Co.
Cabinets, counters and floors oh my…. 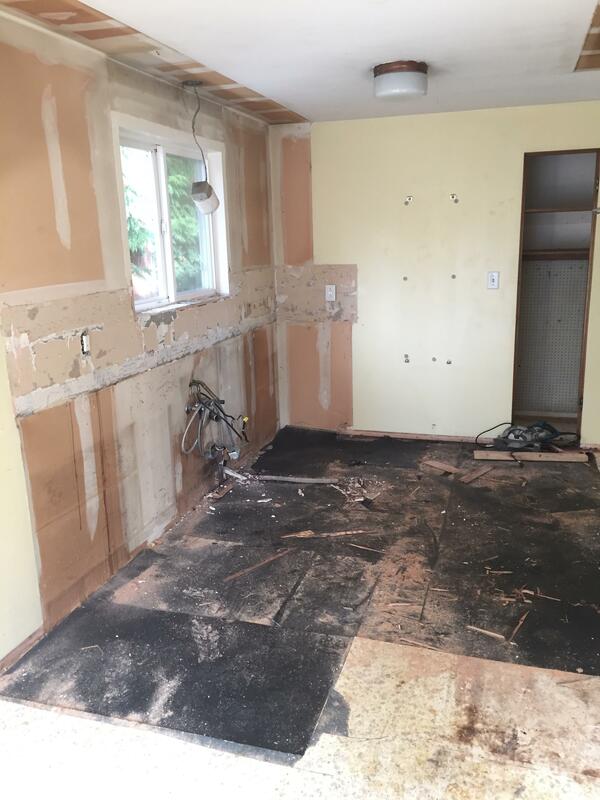 cabinets, counters and floors oh my… It’s great to start seeing less dust and more finish work taking place. This house is starting to look like a real home! The new owners can picture themselves actually living here now that it is all coming together. Our goal is to get this completed by the end of the month. This is where it really gets fun because after each step, we can see a difference. We can see what we had envisioned for our clients come to reality and it’s a great feeling for everyone. 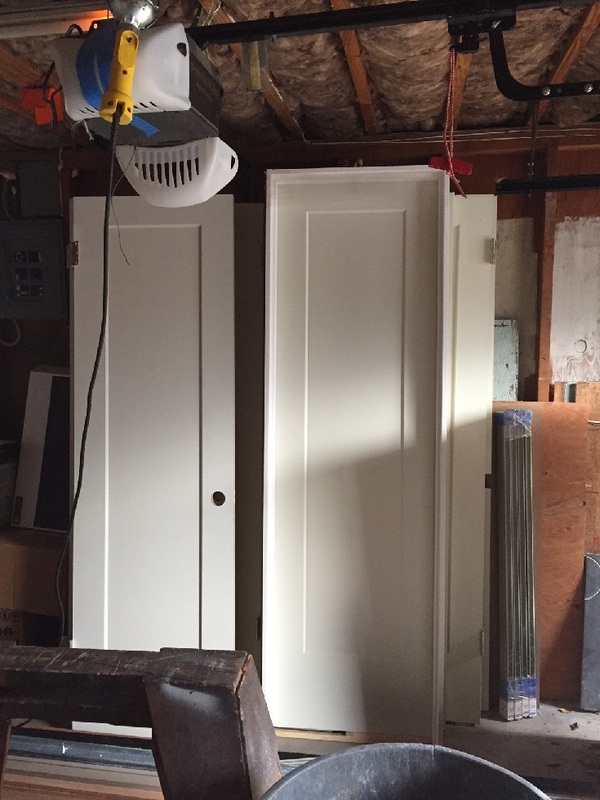 We just had the kitchen cabinets put in, they picked white shaker style cabinet doors and drawers, a very clean traditional and contemporary look. This combination style is called Transitional. Transitional is the blend of both contemporary and traditional. 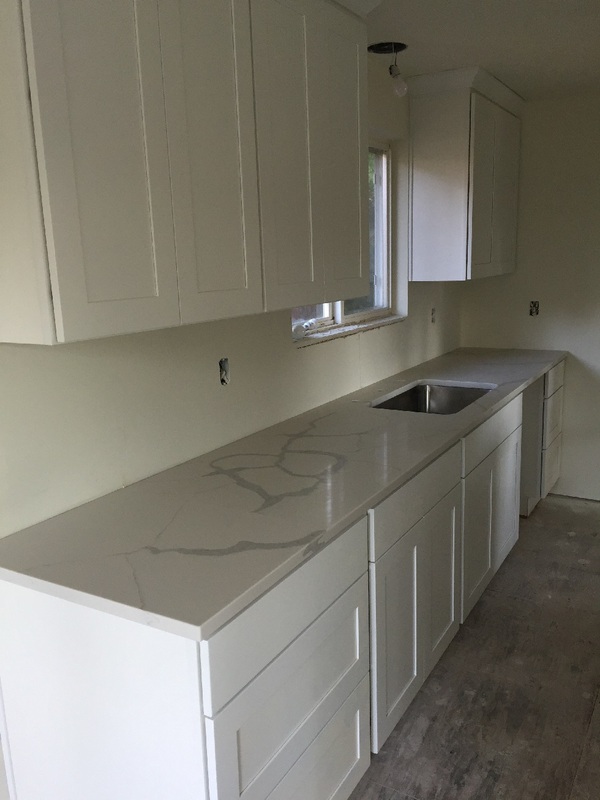 The countertops are a Quartz that look like Carrera marble but are more durable and stain resistant. The color is called White/Grey. Not a very fancy name, but they look fantastic! Put together with the cabinets and this is a high-end kitchen that really looks beautiful and will be timeless. The white on white look is very in style and helps make a smaller kitchen look big. The white on white coupled with the stainless appliances and the darker floors will look rich. Running the hardwood floors into the kitchen pulls the living, dining room and the kitchen all together and also helps to make the spaces come together and look larger than they are. Our clients are in the process of picking out what hardware they like. They are deciding between going with all knobs, all pulls or a mixture of knobs and pulls. They are leaning towards the mix of the two for form and function. They chose satin nickel knobs and pulls that will match with their appliances and faucet. We can’t wait to see this all come together! 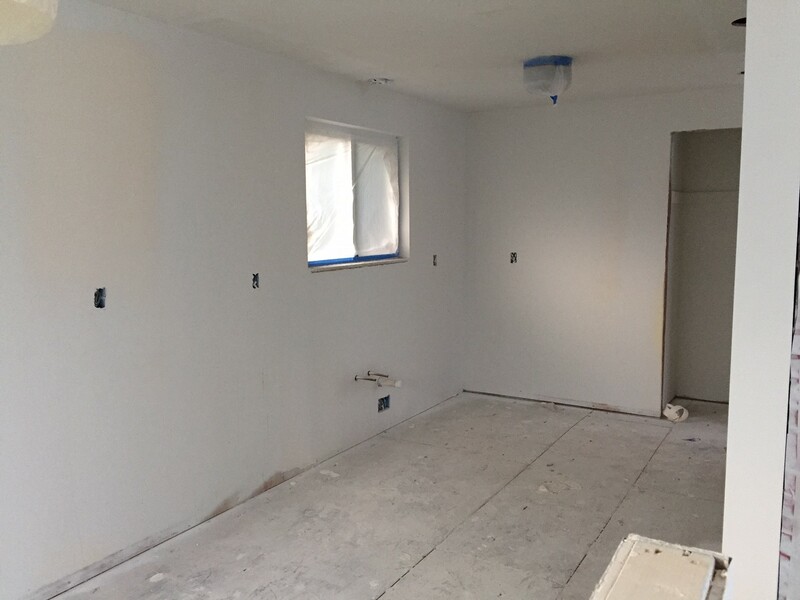 The drywall is done and the guys are also done sanding. Talk about dust everywhere, I don’t know how they do it? 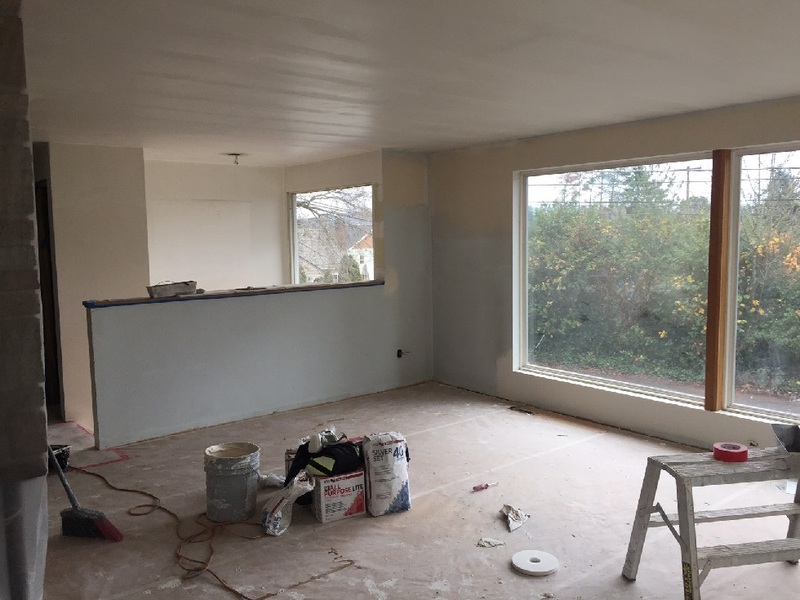 The painters came in after and sprayed all the main floor walls a nice white color. They have moved to the basement and are getting that space all painted. Our clients love the color so much that they decided to keep it throughout the house and keep it clean and light feeling. They may come back later and do an accent wall in the bedrooms, but their furniture will dictate that and they can customize later. We totally agree with this decision and just love the way it looks now. This is actually the first quiet week at the house that we have had since we started remodeling 81 days ago. We had new hardwood floors put in the kitchen and then all the hardwood floors are being sanded and stained (throughout the main floor) This darker, medium brown color will ground the floors and create a nice contrast with the white walls. We had a custom mantel made out of an old slab of wood. This turned out really cool. We did a mantel that wraps around the corner, since the fireplace is a corner one. The mantel was hung last week and looks great. We are going to stain the wood the same color as the floors to pull everything together. The fireplace will also be painted the same color white as the walls and trim. This will keep the space light. With the hardwoods being refinished this week. No one can come or go on the main floor, so we are on hold, but only upstairs. I dropped by to take a few pictures and was blown away by the floor color contrasted with the walls. Since the finish coat is drying I couldn’t go in to get a good photo. I could only take a picture of the floors leading upstairs since I can’t walk on the floors yet. 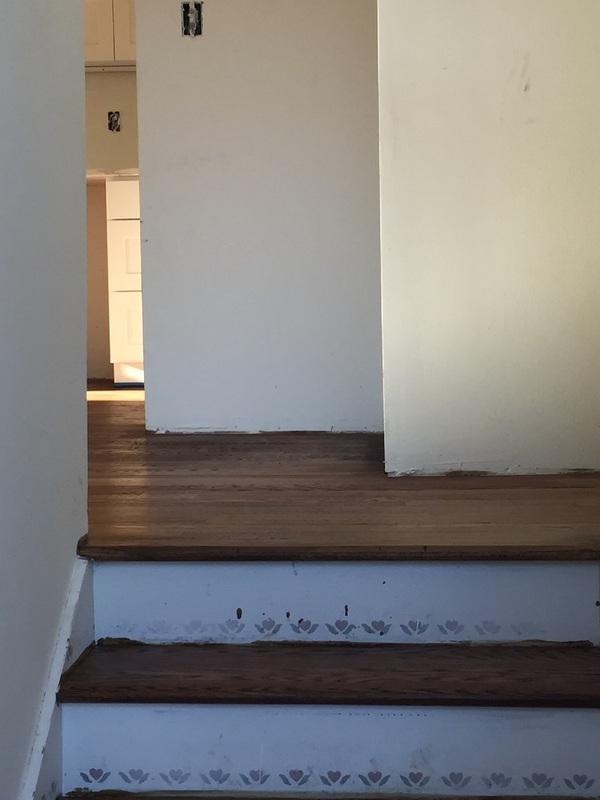 If you can see the flower stencils on the back of the stairs in the photo, it will definitely go and be replaced with an amazing print carpet runner, but you can get an idea of the color of the floors. They are beautiful. Next, we will have the tile installer back to finish up the backsplashes for the main and master bathrooms and kitchen. The electrical trim will be finished with the installation of all the new light fixtures, switches and outlet covers. The Plumbers will be back to install all the faucets, toilets and sinks. All the new doors and trim will be installed, including the front door. 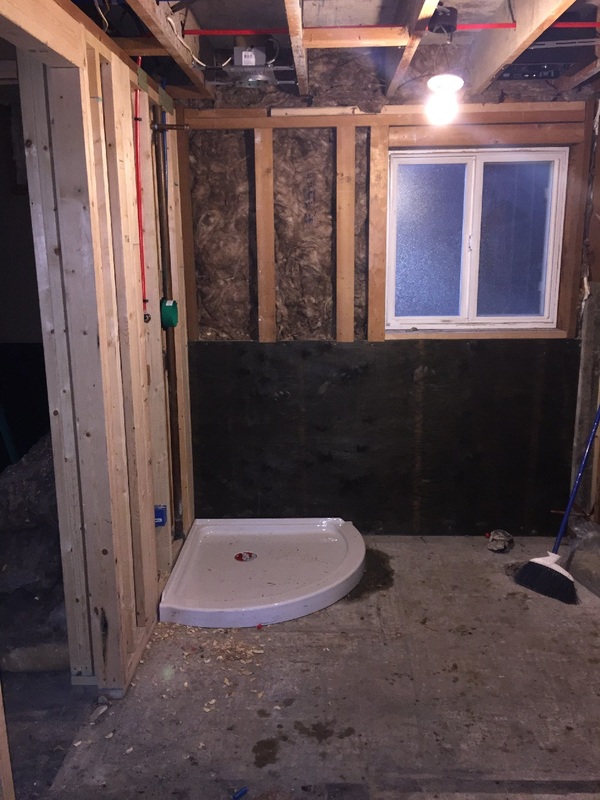 The basement flooring will be installed which is a vinyl plank in the basement, vinyl sheet in the small bathroom and wall to wall carpet in the basement bedroom. This will be durable, functional and stylish. We will finish with a final house clean, to remove all the extra dust, before the new owners move in. Wow, I can’t believe we are almost done. We are so excited for these well deserving clients who have been so appreciative and trusting with our guidance and vision. If all goes well in the next week, they will move in by the end of the month. What a great way to start the new year. Change! With every great plan comes change. Change! With every great plan comes change. When you are buying and selling real estate, you are making a change. When you decide to remodel right after purchasing a new house, there is even more change. When you start out with a plan, there will still be changes. Some that are in the plan and those that come about unexpectedly. What is great though is when you can take that change, and turn it into a better plan than what you had expected. This unexpected change can actually be better in the long run. Well, we have come across such changes, some sudden on the spot and not wanted at the time, but they can make the results better. As time goes by and as we move to finish this house by the end of the year, there have been changes. But luckily for us, our clients have been able to keep up with the changes and make quick decisions to adapt to those changes. When you hire sub-contractors, they fall in line one behind the other for what they are working on. Sometimes if their projects don’t cross paths they can work at the same time, this makes for a crazy busy house of workers. Most times there is an order and they need to follow one after another. But if a problem arises and one contractor gets held up in the process, it backs up the rest of the line of contractors. 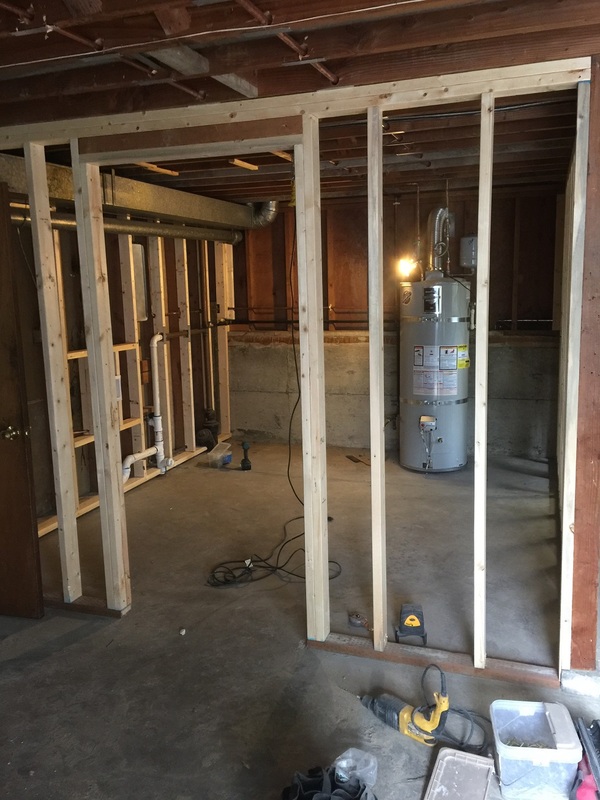 For example, we needed to get all out electrical and plumbing completed and signed off on(inspected) before we could get the drywall and insulation in and then be ready for paint and hardwood floors. We have been running late on both and have been holding up the drywall contractors. Keeping to a schedule and on track is challenging while keeping the flow of work moving quickly and smoothly. 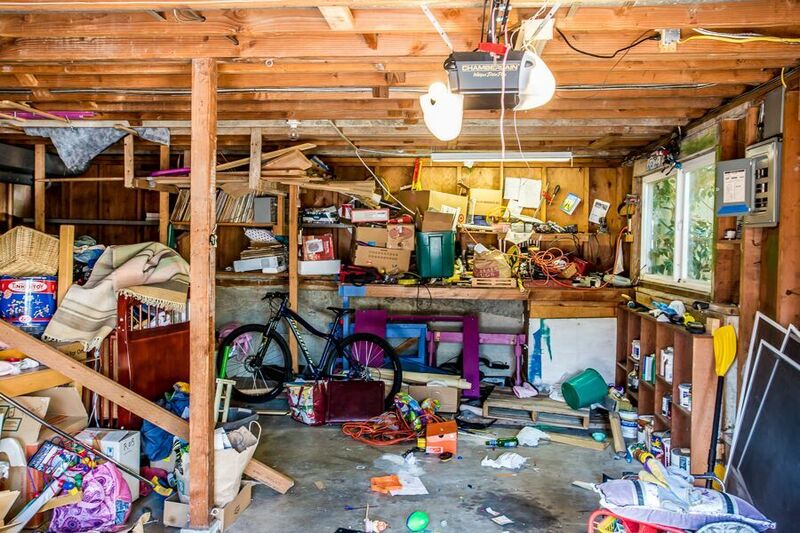 We have heard the term “managed chaos” as the definition of a general contractor and we concur. In preparing to put in the master bathroom shower we had the plumbers coming back for a final rough in before we would get it all signed off on and move on to drywall. So, we bought a one-unit prefabricated shower that was on order. 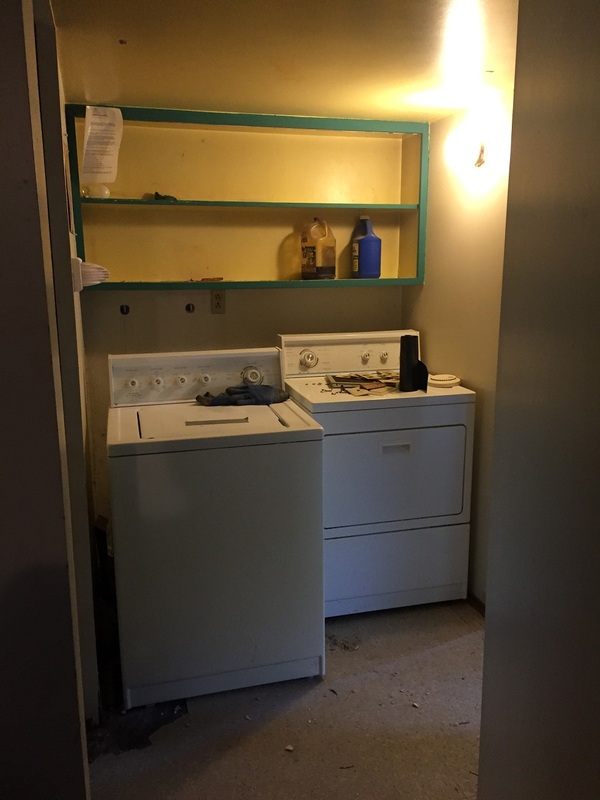 This is a nice unit that gave the owners plenty of elbow room and looked really nice. The existing drain wouldn’t fit with this shower and was corroded so it needed to be replaced. We had a plan when the plumber came out early on Monday morning to have the cement floor jack hammered to move and replace the old drain for the new shower unit. This was done and then the shower unit was delayed. The plumber was asking for the specifications and the actual shower pan for the new shower so they could finish the rough in. After checking on the shower unit we found out it was unexpectedly delayed and we needed to make another quick change for a different, locally available shower unit that would fit in the same spot. So, in working with the plumber, we ran to Lowe’s to pick up a new shower unit, Renee ran to go rent a jackhammer for the carpenter to use and we were all back on track for the plumber by 9am. 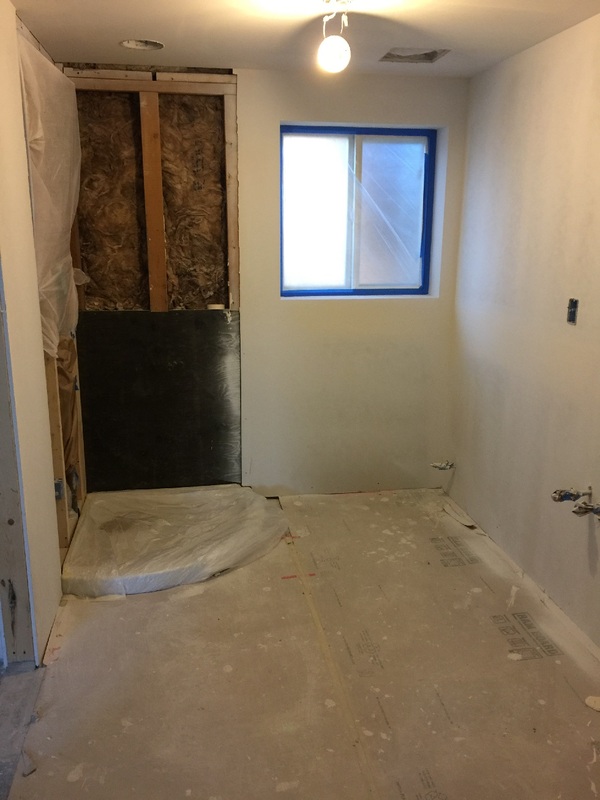 All was fixed and the shower will look better with the beautiful tile walls…which was not in the plan of the first shower surround. Here, change worked out in our favor, but sure made for a crazy Monday! 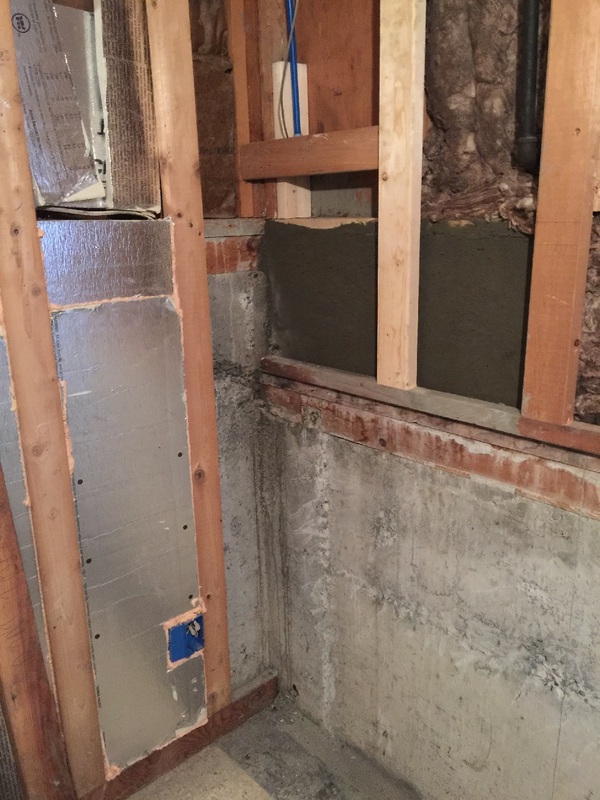 Renee arrived to the house the other day to find out rain was leaking into the basement bedroom through the French drain, which was supposed to keep the basement dry. Another quick change/fix was needed. Our carpenter jumped into action and realized that the foundation on that corner of the house was built too low and water was seeping over it. 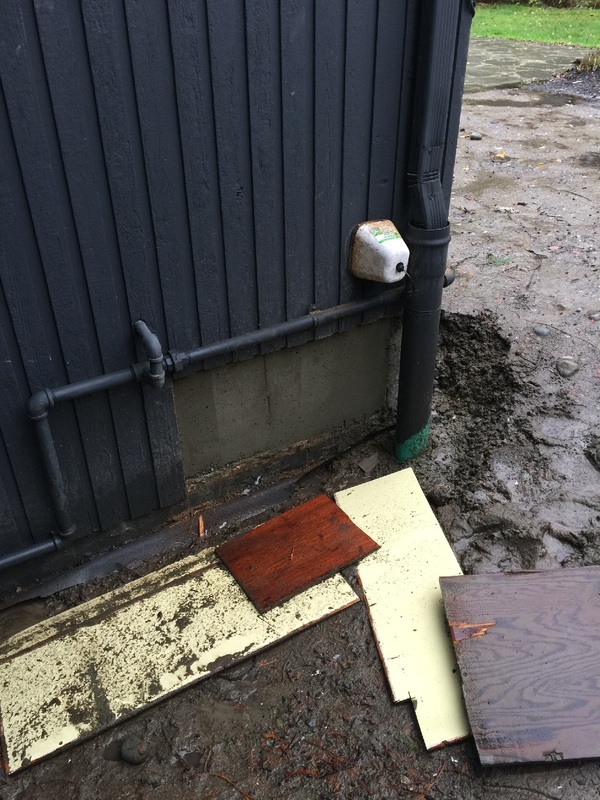 While the rain was coming down outside he tore into the outside of the house siding, got to the studs of the wall and added cement to the existing foundation to create a higher foundation level. 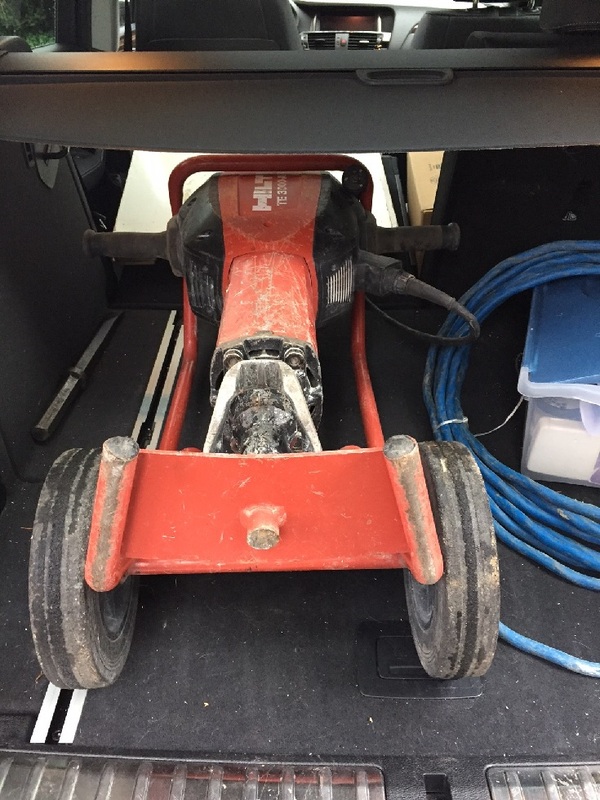 The owner was luckily there that morning and he ran off to Lowes to buy a wheelbarrow and a trowel to mix the cement (they were not expecting to mix concrete that day). Luckily with quick thinking and fast acting, we got this repaired and now the water can’t get in. 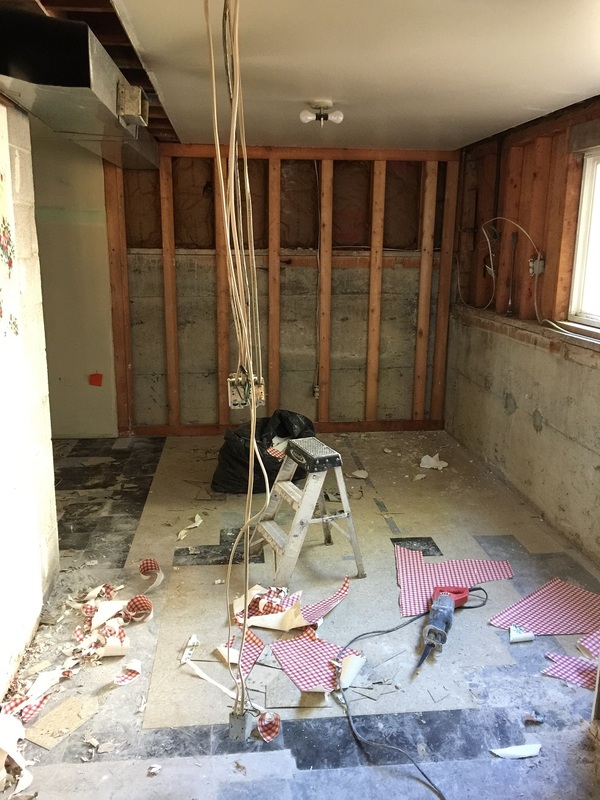 You can’t control the chaos that comes up with a remodel but you can manage it with quick thinking and creative solutions. Having reliable people around who handle pressure and think on their feet to fix the problem is key in moving a project along and getting you to the finish line. Renee is outstanding at handling these situations and our carpenter is smart, creative and cool as a cucumber. 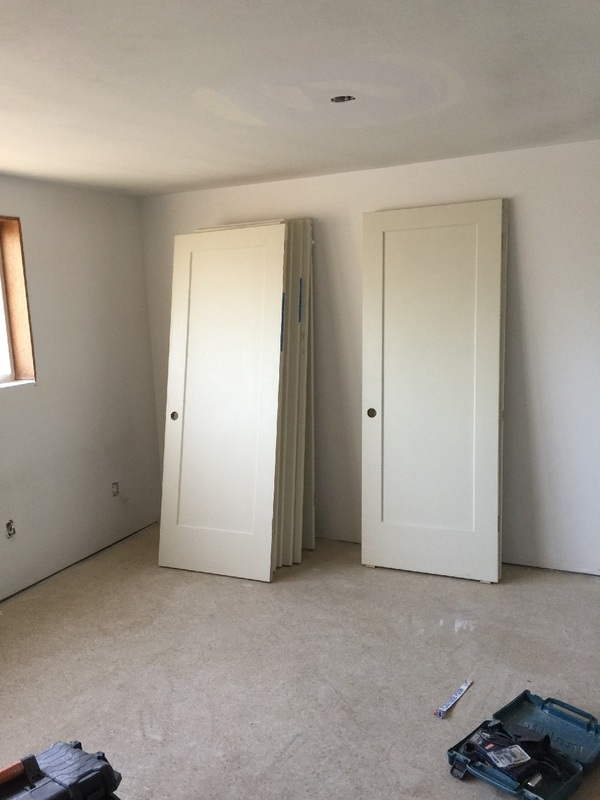 This week we got all of the new doors and closet doors delivered and we are finishing up with the drywall and bathroom tile. It is really starting to look like a real house and not just framing. I’m looking forward to getting the hardwood floors stained, the house painted on the inside and building that new kitchen. Change is happening and will continue to happen even faster at this point as it all comes together. It just keeps getting better and better! Renee Menti Ruhl | Posted in Uncategorized | Tagged Home Remodel, Laurelhurst, Laurelhurst Real Estate, NE Seattle, Real Estate, Renee Menti Ruhl, Renee Ruhl, Seattle, Seattle Design, Seattle Home Design, Seattle Real Estate, Seattle Remodel, Windermere Real Estate Co. The steps you should know to start a remodel, and all things happening at the house. We are starting to see the light at the end of the tunnel. There has been lots of change to the interior and a couple big changes are taking place this week with the exterior-the house is getting new gutters and we are painting. Pray for sun! 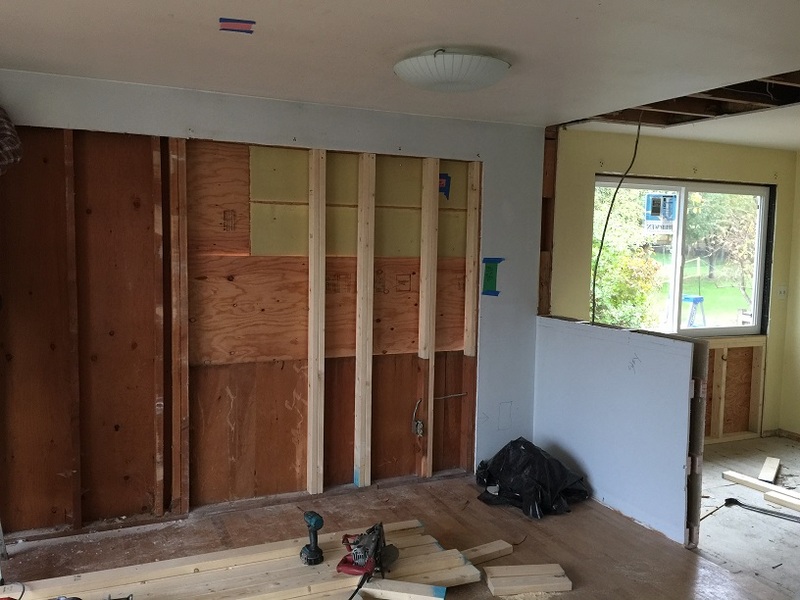 The areas of the house that needed new walls built or walls taken down have been completed. But of course, we can’t have a week without mentioning rats, what fun would that be. While taking out the drywall in the basement bathroom our carpenter thought there was a brillow pad in the wall but it was a dead rat. He also discovered a few rat’s nests in other parts of the basement wall insulation as well. It was funny when he said, “it’s always a surprise”, I bet it is, no thank you. Glad we decided to remove that section of drywall at the last minute. Yuck! I think we are past all the bad stuff (sewers, rot and rats) and can move into the fun stuff! 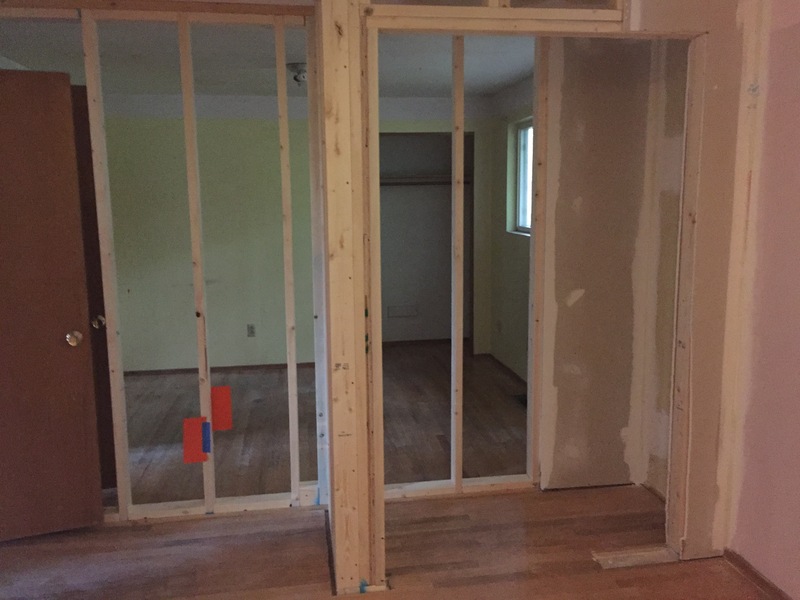 In the last week we built the walls for the new master bedroom, bathroom and closet. It’s so fun to take awkward/inefficient space and make it into a useful/purposeful space. It is completely different! 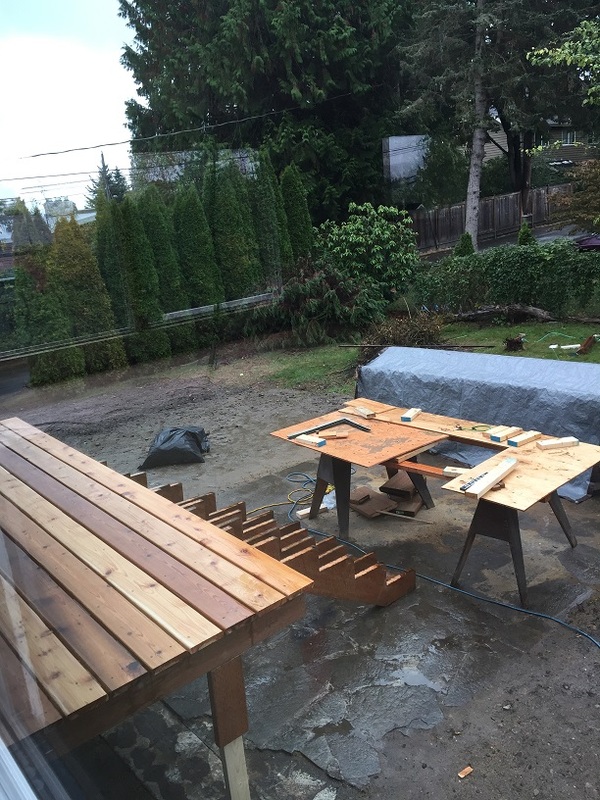 The deck is almost done, it just needs railings and stain. 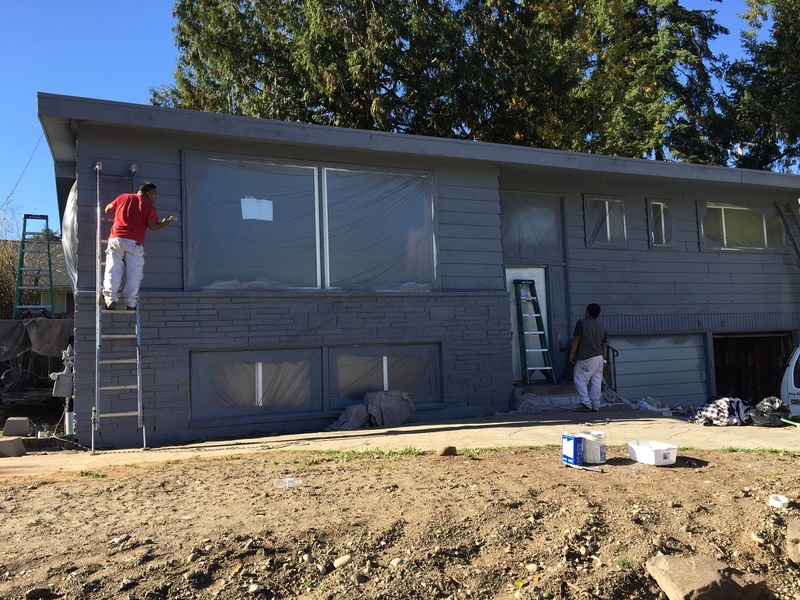 The outside of the house has been prepped for new (dark colored) paint. We want to hide the imperfections and all the different textures and make it pop with creamy white trim. We had a sewer company come out today to scope the master bath toilet and shower drains because the bathroom was so bad we wanted to make sure there wasn’t anything stuck down there (a rat perhaps). We don’t want it to flood after their remodel was done. Thankfully it is all clear and clean. Something to be aware of when you get bids, ALWAYS read the fine print, compare line items and ask questions. We had an example of this just the other day when a garage door company gave us another quote, this one we asked for less expensive doors, but it came in higher from the first bid. This shouldn’t have been the case since we asked for less expensive doors. But in reviewing the two bids we noticed line items that should of been the same dollar amount but were different, this second bid actually came in higher than the first. We are not feeling very confident with them so getting another company to give us a quote. Another slight hurdle. Either Renee or I are on site everyday making sure that everything is going according to plan. There are times that you find a better way to do something or have that “aha moment” over a new idea and it’s exciting because you feel that you are making something really great for our clients. During this process, we ask ourselves questions constantly; how will the clients live in the space and how do we create flow and continuity throughout the house. How does the lighting look, how much lighting (always keeping budget in the back of our minds). Making choices that go with the style of the house and the lifestyle of the clients (how hard will they live in the house, kids and pets add wear), do they want open spaces or storage (always a tough question) and will they want electronics (TV’s, outlets, etc.). 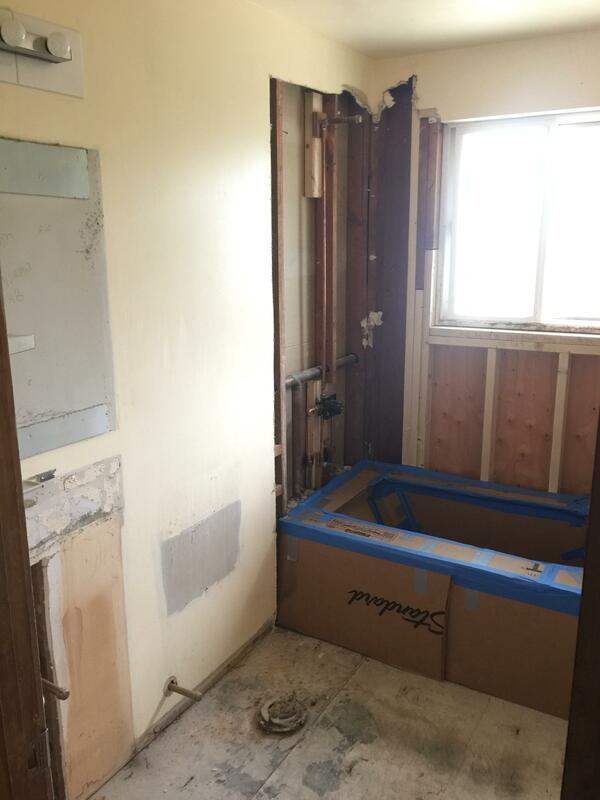 A lot of people find it daunting to take on a remodel, regardless of the size. It can be overwhelming and you just don’t know where to begin. 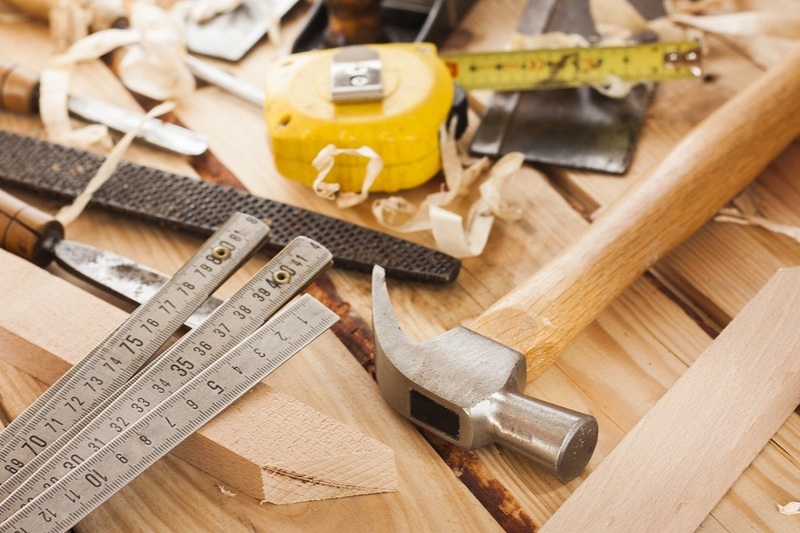 Here are some tips to help get you started if you want to tackle a remodel. First, decide why you would like to remodel. There are several good reasons to renovate. Your home may no longer reflect your tastes or your lifestyle. Your family dynamics may have changed. Maybe you’d like to make your home more environmentally friendly. You may even be planning a move in the future and you would like to invest in your home to make it more marketable (Hint, Renee can help you with that). Whatever the reason, identify it. If there’s more than one, that’s even better! The point is that in order for you to be happy at the end of the project, you need to first understand why you want the change. What are you trying to accomplish? Building this list will help you and your remodeling contractor prioritize during the project. This list will tell you which items to cut if you can’t afford everything and which items to add in, if some of your upgrades aren’t as expensive as you thought. Once your list is complete, think about your budget, but don’t over think it. To many projects get hung up on this and never even begin their projects. You must begin to calculate what you will be comfortable investing in your home, but remember until you meet with a contractor, you won’t be able to take into account what the whole project will cost. Plus, everything is always more expensive and there is always more work than you think. You can’t have a new kitchen without considering the electrical and the plumbing. You typically need to upgrade those items in the process. Once you have created your list of remodeling projects and considered your budget, it’s now time to find a professional contractor, and a designer or architect, who will develop a plan to make your project a reality. Typically the designer or architect will design the project and the contractor will price it and then do the work. Rarely does a contractor design. There are Design-build contractors and they do both (This is what we are emulating on this remodel). Don’t settle for just anyone to remodel your home. Select a contractor that is insured, experienced, and comes with good references. If this person you interview seems too good to be true, this could result in a low-quality renovation and cost you a lot in the end. Ask friends and family for referrals; even posting on social media will get you some names, just ask around. Our clients have been so sweet and have been SO appreciative of all that we have done. They have been giving us gifts of flowers, wine and even baked our carpenter homemade cookies! Especially nice after all the yuck he has had to deal with! The next couples weeks will bring a lot more progress. We have outside painting taking place right now and starting tomorrow the tile is being placed in the main floor bathroom. Then comes electrical, furnace work, more plumbing, new insulation and drywall. Hardwood floor refinishing will be next and then the interior painting. Kitchen cabinets will be installed, tile and trim work completed, then new flooring in the basement and new light fixtures. Soon it will really start to look great! Still lots to do. Stay tuned. Renee Menti Ruhl | Posted in Uncategorized | Tagged Home Remodel, NE Seattle, Renee Menti Ruhl, Renee Ruhl, Renovation, Seattle, Seattle Design, Seattle Home Design, Seattle Real Estate, Seattle Remodel, Windermere Real Estate Co. The dust has settled! Time to start putting the house back together. The dust has settled on almost all of the demolition. Now it’s time to help our clients pick out electrical finishes (lighting, electrical switches, outlet covers, etc.) they want for the house. 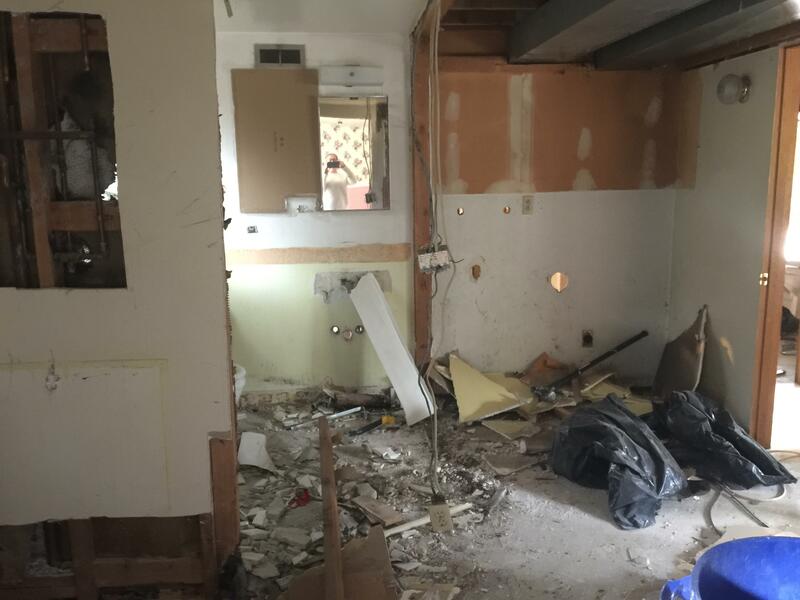 We also need to get the budgets finalized from the last of our sub-contractors so we can hire and get the jobs going and put this house back together. The first bill from the electrician came in was really high because we had lots of extras in it. So, we had to take a closer look at the project and see what really matters and keep our plan simple. Basically, we can only move what needs to be moved and add extra lights/plugs and switches that need to be added. We knew the electrical was bad when we did the house inspection because the box blew up and the hole house went dark. We had to hire an electrician to come out to turn the power back on for the seller so that their food wouldn’t rot and they could have power. In our first bid, our bill was $25,000! This was not including any light fixtures! This can add up in a blink of an eye. Now we are back to reality. I had a walkthrough of the house with the electrician this morning to refine the scope of work and get it to a reasonable amount. How does one walk an electrician through a house and talk electricity? Renee makes it very colorful and actually quite fun. 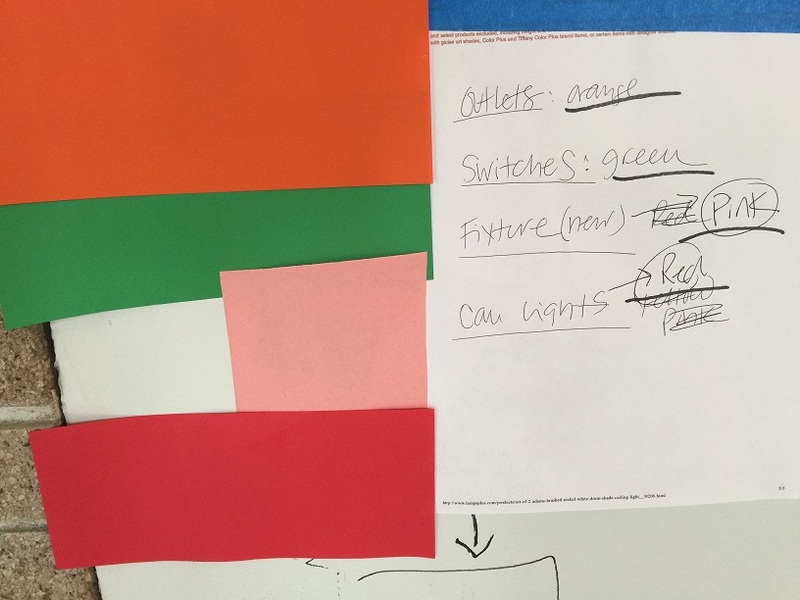 She color-coded everything with construction paper and sharpie writings on the wall. 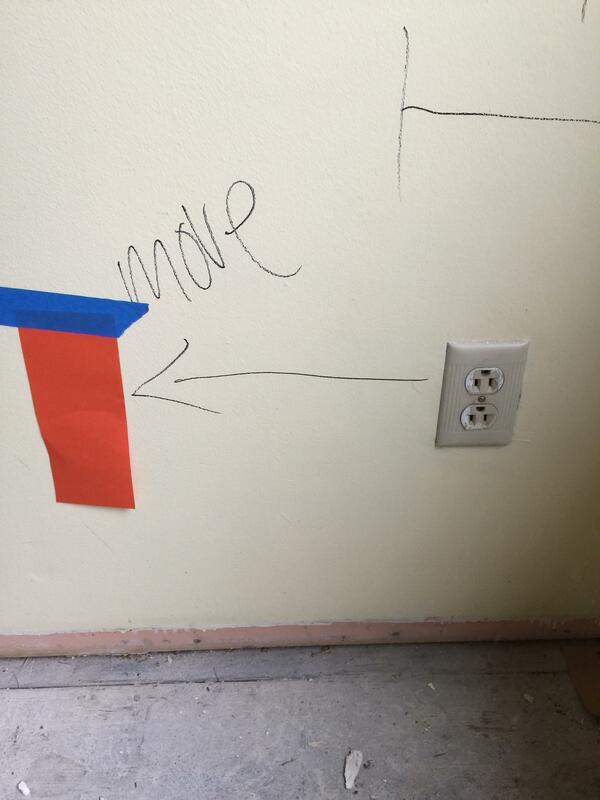 This is one way to keep track of the outlets, ceiling fixtures, etc. and have clear communication with the electrician so that the bid comes back correctly with everything we want. The electrician can just take pictures of each room and remember what Renee needs for that room. But of course, she also writes everything down on paper for him so he has a copy to take with him (Her handwriting isn’t ageing as well as she is! It takes a special eye to understand her handwriting, the electrician only asked me three times what a word said – My life’s problems of an assistant). Clean Crawls came today to clean out the rat/rodent infested attic and insulation, I do not know how they do their job. They get themselves totally covered up to attack the attic, and this attic has the lowest ceilings possible, they are mostly on their stomachs moving around. Yuck! You couldn’t pay me to do that job. It was an easier job getting the rats to move than the sellers! But at least they are all gone now. Our finish carpenter, Dan has replaced the kitchen slider with the new window and was framing the dining room wall for the new slider. Amazing how you can go online and order a window and glass slider from Home Depot and have it delivered the next day. Got to love modern technology. Dan spent the last two days, thankfully it was sunny, building the new deck that will be off of the dining room that will be accessed from the new sliders. 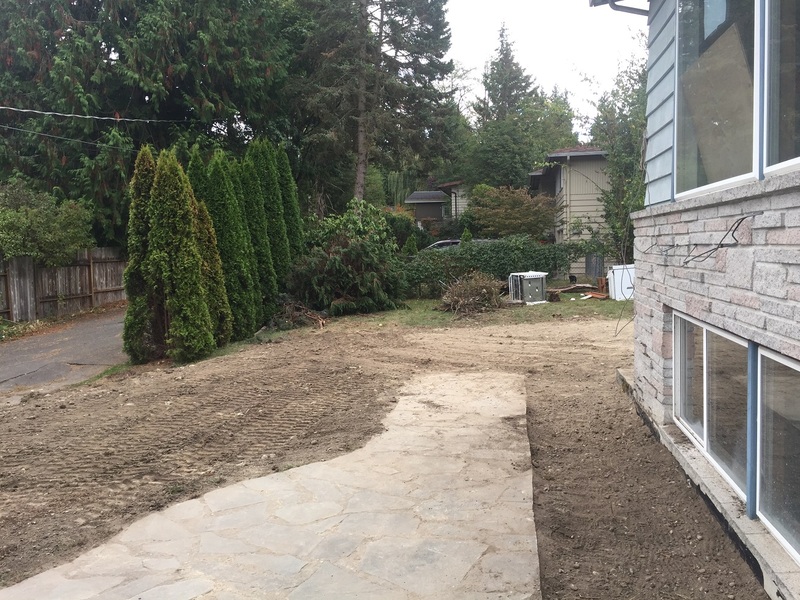 This will be a small BBQ deck and lead down to a patio for outdoor entertaining. Due to cost and the fact that the yard is more private than the deck, it just made more sense to bring it down to the yard. During all this building, Renee and I have been working on other bids and Renee has been keeping track of the budget (I’m not the numbers person in this relationship) and searching for lighting options for our clients. This is the fun part. Pretty soon we will get to look at paint colors, flooring samples and tile. We finalized the kitchen plan and ordered cabinets and countertops. 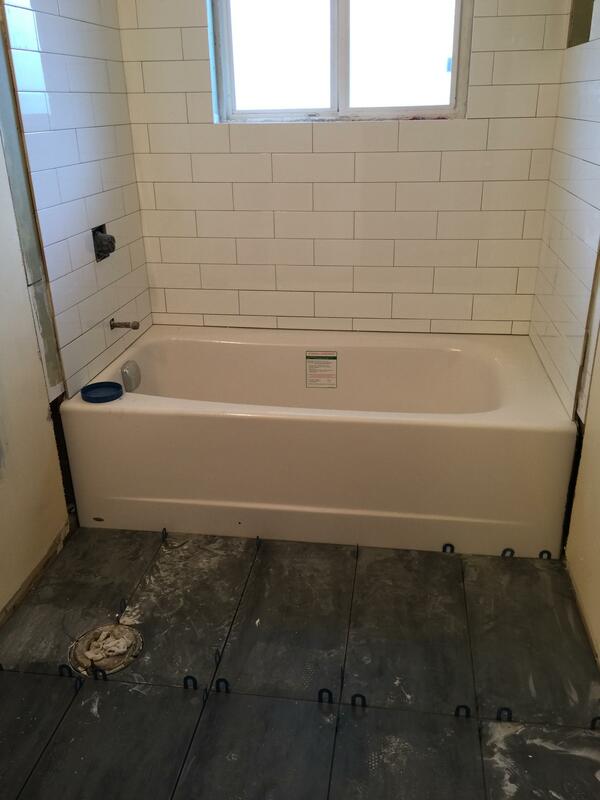 We also have completed the main bath plan and ordered its’ cabinet and countertop. We had extra slab so we are using it for the 1/2 bath countertop. The bathroom fixtures have already been picked out (remember we had to do that day 1 so plumbing could come in and get started). After the electrical is complete and the drywall goes back on in the kitchen and main bathroom, then we can have the cabinets and counter tops installed. Things were crazy for a few weeks but they seem to be slowing down a bit. 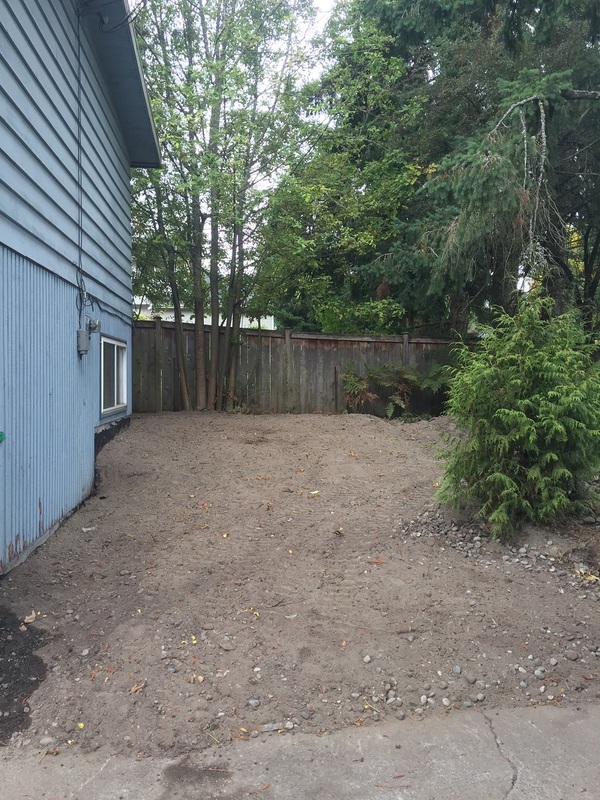 I’m thankful that things are complete and a bit slow right now so we can get our other work done (We listed a house this week in Laurelhurst) and get ready for the next steps here. Thanks for reading and stay tuned. Renee Menti Ruhl | Posted in Uncategorized | Tagged Home Remodel, NE Seattle, Real Estate, Renee Menti Ruhl, Renovation, Seattle Design, Seattle Real Estate, Windermere Real Estate Co.